Planning to take that family vacation you have been dreaming of for ages? Before you get too much excited and start packing, take a look around because the two rambunctious packages currently creating chaos in your living room will make your flight unbearable if you don’t have some tricks up your sleeve. Kids are a blessing when they are asleep and your own personal hell when they are awake. What people don’t realise is that unlike a moody 16 year old teenager, kids are easily distracted. All you need to do is hold them in a fascinating conversation and they will listen to you with rapt attention. You might be subjected to an airport runner, the yeller or I-want-what-you-are-drinking but other than that, everything will be – peachy! At home, there might be a curfew on watching TV and playing games but when on flight, let your kids loose. If the arm rest has that little screen, then flip it out and let them watch a movie. If you have an iPad, download some games, so that when they get bored from watching a movie, they can play on it. The extra screen time will eventually exhaust them and they will go to sleep. 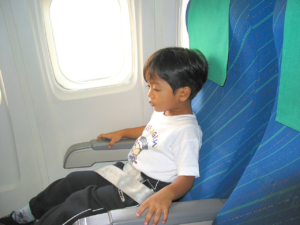 A long flight and stuffy clothes can irritate kids to the point that they won’t sit anywhere for long. To make it easy on you and them, dress them in footie pyjamas, so that they can enjoy the flight comfortably. Moreover, in case of a diaper outburst, you will only have to replace only one soiled clothing item. At one point or another, your kid will surely touch something gross that will have you cringing with disgust. Instead of using a single cloth wipe over and over again, load up on those individual anti-bacterial wipes. You don’t know what the bathroom situation will be and these wipes will feel like a godsend when a sticky situation comes up. Now that you are a mother, it’s all about the kids. The carry on you are taking with you, must contain all the essentials your kid might need. Do keep a t-shirt or two for yourself for those unexpected vomits but other than that, make sure everything in it belongs to them. Plus, a single carry on will give you the freedom to hold your kid and navigate through customs easily. Food served in airplanes is not necessarily to every kid’s liking. They may taste the food in the excitement of unwrapping those small bowls and plates but it’s possible that they might not eat it after taking the first bite. For situations like these, do bring along snacks that are approved by the customs and airport authorities. Most parents leave the discipline at home while travelling with kids. Yes, it’s time to let your kid a little loose but not so much that they start disturbing the other passengers and flight attendants. They might give them indulgent looks but nobody likes a kid running down the aisle and creating chaos. Try these tips and you will be able to keep them calm, and enjoy your flight in peace.